The 2014 Communities for Nature Small Grants Funding Opportunity is open. 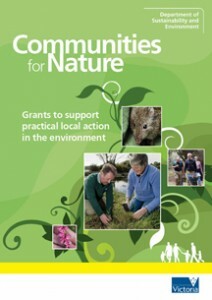 The Victorian Government has launched the 2014 Communities for Nature Small Grants Funding Opportunity. The Communities for Nature 2014 Small Grants Funding Opportunity aims to support practical action by community groups, schools, and volunteer organisations to deliver measurable environmental outcomes through on-ground works. The Funding Opportunity will provide $2,000,000 to community groups seeking one year grants for small grants up to $10,000 (GST inclusive). Projects that will be completed by 30 June 2015 are eligible for funding. Applications can be submitted online and will close at 4.00pm Friday 11th April 2014. If you would like further information, please contact the Grants Information Line on 1300 366 356 between 8.30am and 5:00pm Monday to Friday.